Hot from 2017 hit Get Out, comedian-turned-director Jordan Peele is back in the horror playhouse, confirming his preternatural, studied mastery of the genre. Forget the presumptive denial of terms of “elevated” and “post-horror” – Us is a true genre flick, polished to a fine degree, a pure distillation of the essence of horror cinema. From the opening sequence, it’s clear that this is a different beast to Get Out. Where that film favoured a slow burn, gradually ratcheting up the tension to find the horror in its final act, here the terror is unleashed from the start. The creepy, oppressive score from Michael Abels and Michael Gioulakis’ rich, expressionistic cinematography work to create an unambiguous atmosphere of dread; an aspect of horror that is often forgotten is that it can be deeply pleasurable. 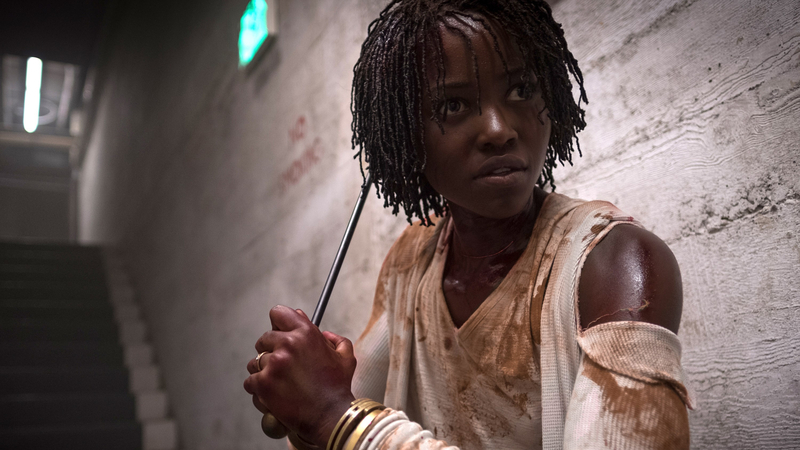 Coming from comedy – another genre routinely discarded by critics for eliciting physiological responses in its audience – Peele has an inherent understanding of the pleasure in terror and its relationship to humour. The result of this understanding is an experience that is both deeply suspenseful and aesthetically lush. Opening in 1986 during the ‘hands across America’ campaign, a young Adelaide (Madison Curry) wanders off from her dad at a carnival, on to the beach to find a hall of mirrors. It’s a classic genre trope, recalling the trashy pleasures of cult film Malatesta’s Carnival of Blood as much as the distorted spaces of silent classic The Cabinet of Dr. Caligari. Inside the hall, Adelaide is met with her double in a delightfully creepy image. Years later, Adelaide is married with two children. Desptie her protestations, her husband (fellow Black Panther alumnus Winston Duke) insists on returning to the beach for a family vacation. Eerie coincidences begin to mount – like a frisbee landing perfectly in the circle of a beach towel – hearkening the return of the mirror girl. And return she does, bringing with her a terrible brood, an inverse of the Wilson family. Where the Wilsons are respectable, middle class Americans, their mirrors are singularly monstrous, their movements uncannily graceful, mute save for animalistic howls and grunts. The exception is the Other Adelaide, speaking in tortured inhalations, as she recounts her bizarre fairy-tale story. Truly, Nyong’o’s dual-turn as Adelaide and ‘Red’ is astonishing in its balancing of empathy and unadulterated terror. It’s clear that as a director, Peele’s cinema is steeped in the history of horror – for those looking, German expressionist cinema, Night of the Living Dead, Italian giallo and The Stepford Wives are but some of the imprints to be found in the fabric of his work. But two films in, it’s Peele’s fixation on the human face that is truly fascinating. Repeating his trick from Get Out of having his characters look directly into the camera, wide-eyed, often weeping, in dread, awe, menace or a mixture of all three. If the number one rule in horror is to never show the monster, Peele gleefully breaks it, forcing his characters and his audience to gaze directly into its face. Perhaps what is most terrifying is the humanity that stares back.